Speed reading plugins and apps seem to come and go as fast as the words do at you in RSVP reading. 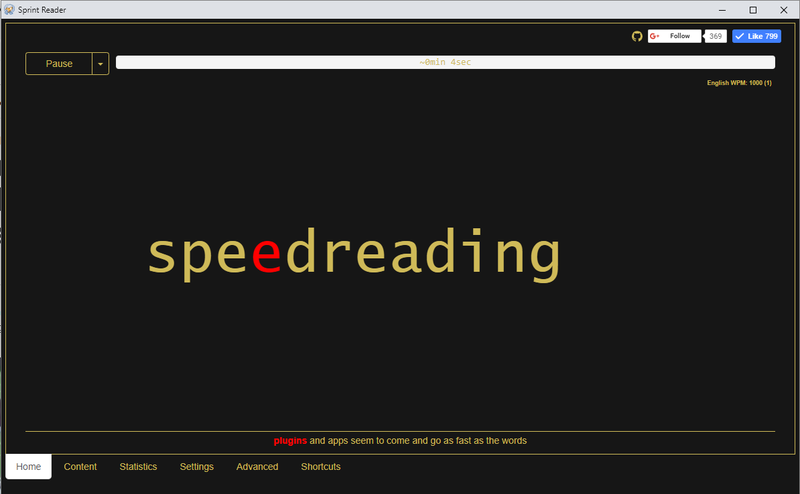 I am currently using a combination of two extensions to enable my speed reading in Chrome. If you don’t know what RSVP speed reading is, it has nothing to do with attending any sort of reading event 😉 It stands for Rapid Serial Visual Presentation (RSVP). It is a process where the words are presenting to you one at a time in a rapid series. Ideally, and in the more advanced versions, the words are offset to a specific point so that your eye does not have to move. It turns out that the eye movement between words, called a saccade, is actually a major impediment in reading speed and also in causing your eyes to fatigue, which may cause you to stop reading or to become tired. Optimal RSVP setups will also use some logic to insert pauses after periods, commas and other punctuation, so that your brain can register them. I find these little tweaks make a huge difference. Check out this creepy gif of an eye not having to move while doing RSVP reading with the offset words. Basic RSVP reading had been around for a long time until a company called Spritz released a sort of algorithmic update to it that integrated these improvements. Unfortunately, their business model was kind of lame and required anyone utilizing their technology to send the data to their server and it was slow. Lame. But fortunately, many people just implemented these techniques on other readers and these have proliferated. Rocket Readability is still in active development as of this post, and is super fast at applying “readability.js” to cut the crap and leave you with just the words you need to speed read (otherwise suddenly reading ad text will throw you off, but you’re still screwed on pull quotes though…). Once the words are isolated, I highlight the part I want to start reading at (usually I read a paragraph or two normally before I decide whether I want to read the whole article). Then I use Sprint Reader to RSVP speed read the text. The default settings in this app are pretty good, I would recommend starting somewhere between maybe 500-600 WPM. If the text is too fast you can use the hot keys Z to slow it down and X to speed it up. And if you miss something use A to go back (and S to go forward). Once you practice at a fast speed, going back down will make it seem really slow. So I recommend for practice, to go faster than you are comfortable with, then slow it down. Then when that feels slow and you are comprehending, move the speed back up and repeat the process. Are you reading this sentence “out loud” inside your head? Well, if you ever want to be able to read faster than you can “speak” inside your mind, you’ll need to cut that out. Shhhh. Just look at the word and internalize the meaning or see it as an image. Speaking aloud to yourself in my your mind is known as subvocalization, and it is holding you back. You should try and minimize it even when you aren’t speed reading… And that’s pretty much all you need to know to get started! Auto start 1 second (so you don’t have to click anything) and also check the box for auto close when done, so it automatically disappears. I like dark, high-contrast color settings. Select “show remaining time” it helps your brain stay on task reading if you know how long until you are done. Under Advanced – Click “More” – Then turn on the shortcut CTRL+ALT – then you can activate the shortcut, and simply hover over text and press Z to start the window. I currently start my readings at 1000 WPM. Sometimes the text is complex and I have to slow down to understand it, sometimes, with fluff pieces and interviews, 1000 wpm seems tediously slow, so I speed it up to 1100-1200 wpm. Depending on how alert you are, including time of day, and other substances in your body, your ability to perceive words at a given speed will be altered. I have a noticeable increase in my ability to comprehend at higher speeds when I am fully alert and loaded up with nootropics. At the end of the day when I am tired, I may go down to 750-850 wpm to be comfortable. The good thing with speed reading though is that even my “comfortable/lazy” speed is still 2-3x a normal person’s reading speed. Investing a little time in adjusting to speed reading pays dividends, for example, you could have been done reading this article minutes ago 😉 Get to it, good luck! And ps for all the non-believers out there wondering about comprehension, I rather read something at 1000 wpm 2 times than read it once at 500 wpm, or more likely, just not have read it at all. And obviously, I don’t read business contracts or other super sensitive/important documents through this. It is ideal for quick reads when you otherwise would just exit the tab, or if you just need some general understanding of a wordy concept. That said, I have read entire books in this manner and have for years. Who do you think has better conceptualization of a story, the person who read it in a single 3.5 hour session (hat tip to Ready Player One) and understands it like a continuous movie in their mind, or the person who read it in fits and spurts over weeks or months and isn’t even sure what happened in the prior chapter?